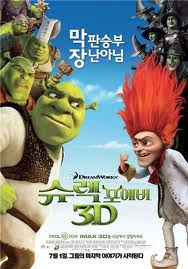 I'd been waiting to see Shrek 4 in 3D. When Darmesh and I arrived back in Seoul from Jeju, the first thing I did was to check if it was still playing. CGV in Gangnam was the only cinema showing it - for the last time. I didn't even have to think twice about it...and off we went to Seoul. It was my first time going to that CGV - it was pretty nice, especially that I got to learn about a Twin Combo popcorn: You can get salted & caramel popcorn which comes with a divider...I never knew! Anyway, we both thoroughly enjoyed Shrek 4. We had a bite to eat at Subway and made our way home. We were both exhausted. It was also extremely hot.